Yes, we’re reporting on potato chips. 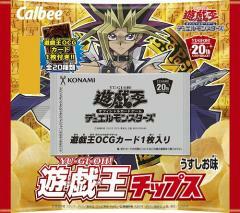 Japanese snack food maker, Calbee, is collaberating with the Yu-Gi-Oh! brand to release Yu-Gi-Oh! Potato Chips. They’ll be sold for 100 Yen a pack. And the chips come with 1 of 20 Yu-Gi-Oh! Official Card Game Cards.